This was a proposal submitted to the 2014 Arch Grants funding competition. Sadly, we didn't make the final round, but we're posting the proposal's details here on request from community mesh wifi enthusiast. A related topic is our rooftop solar mesh concept Sunflower Mesh. The Wasabi Pea is a low-cost meshing WiFi hotspot easily deployable in small or large numbers, with additional provision for battery operation in emergencies. Some backround: WasabiNet develops and deploys low-cost, neighborhood-scale mesh wireless broadband technology for rooftops with low operating costs and high adaptability. We acheive this by combining rugged, economical, 802.11 wireless radios with highly-refined firmware components, carefully integrated from strategic partners in the Open Source community and elsewhere. However, substantial effort is required in deploying this equipment to rooftops and building exteriors. Scaling down this technology into ultra-low-cost WiFi devices puts the flexibility and adaptability of mesh networking into the hands of individuals, small businesses, community groups, and even small towns. Transitioning from rooftop antenna mounts the size of a satellite TV dish to dozens of small boxes the size of a Klondike bar offers a trade-off of speed for intimately palpable ubiquity, whereby the small WiFi devices take on a more intuitive nature, i.e. that one may scatter them like Easter eggs to get broader coverage. However, instead of Easter Eggs, we'll call these new devices Wasabi Peas. 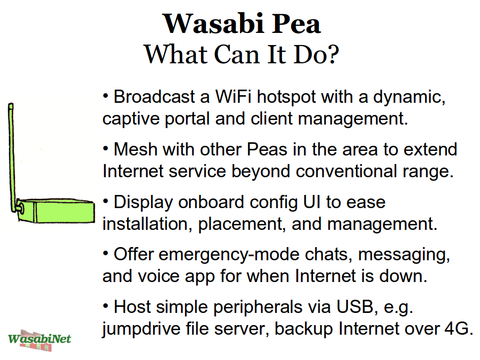 In normal operation, Wasabi Peas would offer managed public WiFi service, in that the one (or more) Peas given an Internet connection would extend that connection wirelessly to all other Peas in the mesh. This Internet access would include the conventional “Hotspot” features such as a captive portal with ads or aggregated content, vouchers for enhanced service, abuse monitoring, along with the collection of usage statistics for the operator. Further refinements could include the meshing protocol 802.11s for “Internet of Things”-style networks, along with the roaming/inter-networking enhancements in 802.11u that facilitate mobile access. In addition, each Wasabi Pea itself would run a minified, mobile-friendly admin UI which the operator may view on his phone or tablet, assisting with optimal antenna placement, bandwidth management, and overall network health. That is, imagine the Easter egg in your hand telling you, “Don't hide me here. Too close to that blue one. Try over there by the bushes.” However, these services for WiFi management are already well established in the market, and they are offered in various forms (even with WiFi meshing) by Cloudtrax, Meraki, and others. 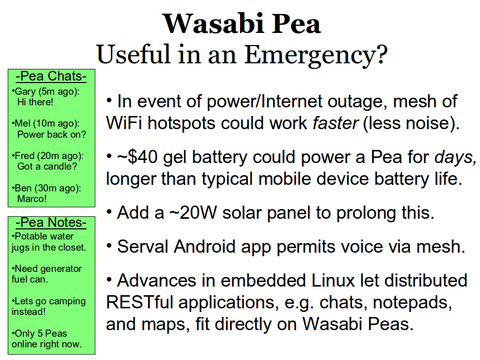 The innovation in Wasabi Peas would be their smaller and lower cost than comparable devices, allowing the deployment of more devices to spread service and balance load. Their inherent trade-off of speed of service for more flexible deployment would be presented clearly and intuitively to the user, via a dynamic admin UI on his phone or tablet, to let the user make optimal choices for details like spacing between peas, channel assignments, whether the mesh is too crowded, user load balancing, etc. The innovation would continue in Wasabi Peas' ability to run on solar power with battery, giving the Peas the ability to make themselves useful during a power outage or similar emergency. 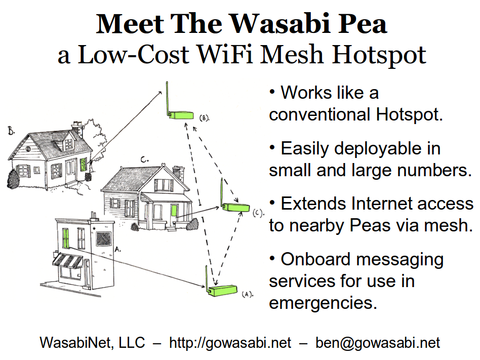 Able to detect the loss of Internet and/or electrical service (or so commanded by the operator), a battery-backed Wasabi Peas could switch out of its conventional Hotspot mode, offering services like a simplified chat and notepad app, shareable by all users in the mesh, draggable/clickable maps of the area that were previously uploaded by the operator, and even limited provision for short VoIP sessions for phones running the Serval Android app. The slimmed down form factor for such Wasabi Peas is already established as a viable, low-cost product, sold by TP-Link in several varieties as $30-40 travel WiFi routers, and also by the Village Telco Project as the Mesh Potato v2. Indeed, both of these devices would operate just fine as a Wasabi Pea, and likewise their ongoing production permits the licensed manufacture of the similar Wasabi Pea to be that much more cost-efficient. A further benefit of this form factor is also very low power, 5 to 7 Watts. Wasabi Peas that sip electricity at this rate could comfortably draw power from a laptop USB port, but more interestingly, they could also run on a solar panel and battery, for entirely gridless operation. 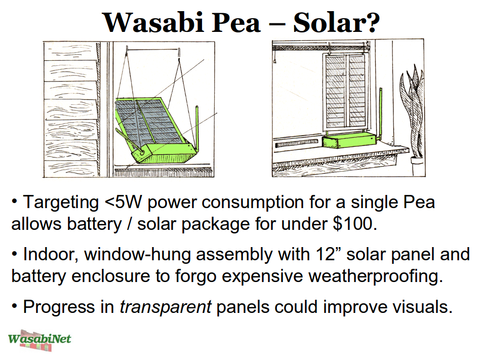 By envisioning a target price of $30-50 for the basic Wasabi Pea (with additional options for a solar panel, battery, larger antenna, etc), and with no limit on the numbers Peas one may operate, a collection of peas would be affordable not just to individuals, but also to business owners large and small, neighborhood and business associations, hotels, shopping malls, church groups, festival organizers, town councils, and even Emergency Management Associations (EMAs). Customers with large collections (or small ones) could also subscribe to paid, monthly support services from WasabiNet, for answers and advice on more challenging questions. Likewise, “White Label” options, whereby custom branding is printed on the Peas themselves and associated management services, would also be offered for bulk purchases. Peering under the hood of a Wasabi Pea, one would find the creative integration of many unique Open Source components in the firmware and associated services in the Cloud, along with the partnerships which WasabiNet has nurtured. Specifically, this would include the Commotion Wireless firmware created by the New America Foundation, its parent the OpenWRT open firmware platform, the Serval app for mesh-based voice service, and lightweight yet robust captive portal technology by Coova.org. Leveraging Open Source as such would provide a far gentler incline on the road to a working Wasabi Pea, greatly reducing the unique development to be done, and allowing it to be done on a modest budget with small staff. Given an initial budget of $50,000, we project an 18-month period to write, refine, and test firmware elements of the Wasabi Pea on suitable off-the-shelf devices like TP-Link products. This would include the implementation of the features described above, along with periodic code sprints with partners like Commotion and Serval to pursue bugfixes and maintain development sync. In addition, this period would include limited testing for a hardware design, i.e. picking apart the test mules and modifying them, on the road to the design of a proper Pea. Feel free to check out the video and browse the PDF attachment of our pitchdeck below! Illustrations courtesty and copyright (2014) Derrick Mosley.